The more than 700 respondents to the survey named “large-scale involuntary migration” as the most likely global risk over the next 10 years, while pointing to “failure of climate-change mitigation and adaptation” as the risk that could have the greatest impact on the world. The poll was conducted in the fall of 2015, and the experts might have been responding, in part, to current events at the time. The refugee crisis spawned by the ongoing conflict in Syria has been a consistent thread in many news stories, from terrorist attacks in Paris and Turkey, to anti-refugee sentiments in Eastern Europe, to sexual assaults in Germany. Recently, much of the world was also focused on climate change, as 195 nations met in December at the United Nations’ Paris conference to agree on a plan that would keep the rise in global temperatures below 2 degrees Celsius. For their part, publics around the world generally agree with the experts on the risks posed by climate change and destabilization in Syria. Majorities in all 40 countries surveyed by Pew Research Center in 2015 consider global warming a serious problem. 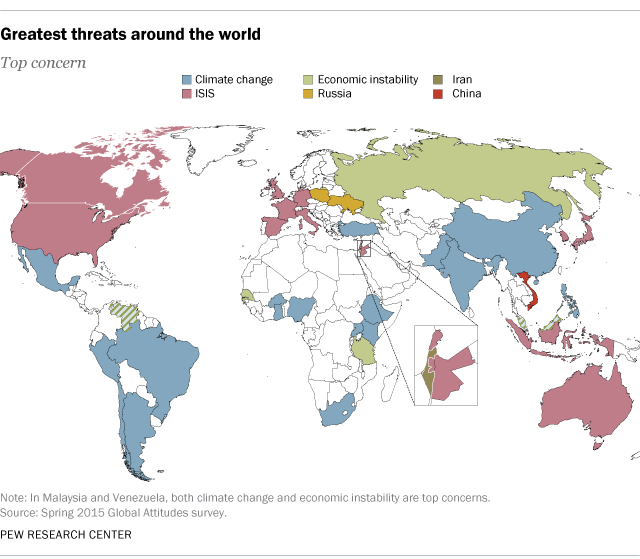 Additionally, publics in 19 nations name climate change as the leading global threat. Concerns about the world’s climate are especially pronounced in the global South. Publics in the West and Middle East also share concerns about climate change, but they most frequently cite the threat posed by ISIS, which has been one of the primary causes of the flood of refugees from areas it controls in Iraq and Syria to neighboring countries, Europe and beyond. Since 2007, the top threats cited by experts have moved from those that are economically based (stock market crashes, income inequality and fiscal crises) to other large-scale issues, such as the environment and geopolitical conflicts. This can be seen in the progression of the top threats, in terms of both likelihood and impact. But even if all eyes are currently on climate change and the consequences of the Syrian conflict, global publics are not likely to forget about the economy anytime soon. In our spring 2015 survey, global economic instability was the second biggest concern in 20 countries, and was the top concern in Russia. Concerns about the economy may have intensified with reports of a slowdown in China and subsequent falls in stock markets and oil prices around the globe. Furthermore, in a recent PricewaterhouseCoopers survey of more than 1,300 top executives around the world, only 27% think the global economy will improve in 2016. In this context, the economy might once again surface as the greatest risk for the world, as seen by both publics and experts. 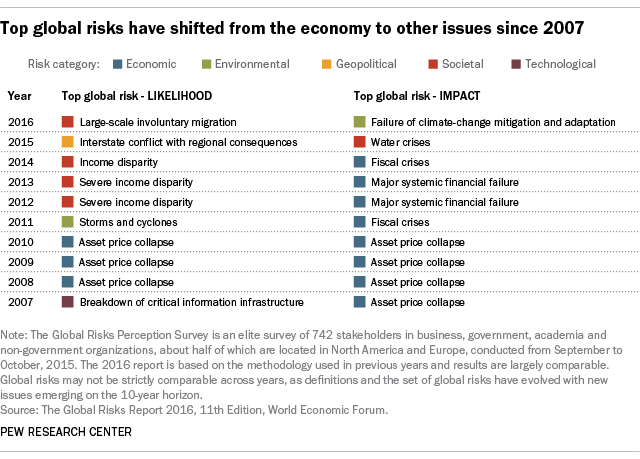 Note: Richard Wike, director of global attitudes research at Pew Research Center, participated as a respondent in the World Economic Forum’s 2015 Global Risks Perceptions Survey.